The government has banned foreigners from providing photography-related services as well as operating souvenir shops and customs bonded warehouses in a bid to boost youth employment. 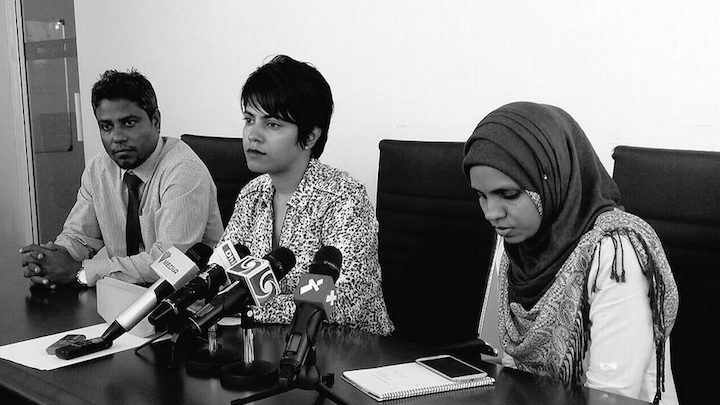 Registrar of companies Mariyam Visam told the press yesterday that the ministry will not register foreign investments in the selected fields. Foreign investments in passenger transfer services and water sports will also be restricted to partnerships with companies with at least a 51 percent stake owned by Maldivians. “If Maldivians can’t enter these ancillary services in the tourism industry, the economy and standard of living will be adversely affected,” she said. Most local photographers and souvenir businesses have welcomed the ban. But some have said foreign investments are crucial for small and medium enterprises to thrive. Some 26.5 per cent of Maldivians aged 15 to 24 are unemployed, according to World Bank statistics from 2013, the most recent figures available. The secretary general of the Maldives Photography Association, Ahmed Ishan, said the ban would create more opportunities for local photographers. “There are about 1,500 Maldivian professional photographers in the industry. But Maldivians aren’t allowed on some resorts due to the influence of some [foreign] companies,” he said. The foreign companies were established in 2012 and primarily employed photographers from Philippines and China, he said. They were often “stationed” at resorts as resident photographers. “So all the work goes to them,” he added. He also claimed that some of the photographers had fraudulent work permits. In January, the economic development ministry ceased issuing work permits for foreign photographers while a ban on foreigners working as cashiers took effect in April. Last week, the immigration department instructed local businesses to send back migrant workers hired as photographers and cashiers before June 7 and apply for cancellation of employment approvals. The department warned that employers who do not comply will be penalised. The economic ministry has meanwhile penalised 88 businesses found to employ foreign cashiers. The ministry will conduct inspections on the new rules and offer a period for foreigners involved in restricted business to leave, Visam said yesterday. Agreements with foreign parties will not be renewed and the ministry will take action against businesses registered under Maldivians but operated by foreigners, she warned. Hassan Zahir, the manager of the Misraab souvenir shop, welcomed the move as a positive step as many Maldivians were involved in the souvenir trade. “This is an ordinary or medium-sized business, so it’s not good when foreigners come in. Not everyone can be resort owners,” he said. The restrictions will create job opportunities for young Maldivians in the absence of competition from foreign businesses who have more resources and more capital, Zahir suggested. However, officials from another souvenir business, who wished to remain anonymous, questioned the effectiveness of the move, noting that foreigners operate the souvenir shops in resorts run by foreign companies. Maldivians should be allowed the opportunity to run souvenir shops in all resorts, they said. Meanwhile, Saudhulla Ahmed, secretary general of the Maldives Trade Union, an NGO set up last year for advocacy on behalf of small and medium-sized businesses, told Minivan News that foreign investment was crucial for small businesses to thrive. Saudhullah also said the government has impeded small businesses by cutting electricity subsidies and reducing business hours with a 10:00pm closing time. Local businesses are”living in fear” and lacked security for their investments due to arbitrary measures from the government, he continued. “We have had complaints from businesses about the customs saying they mistakenly charged too little as duties for goods imported two years ago, and so customs is now asking for MVR230,000 in fines,” he said. The ministry was imposing restrictions on foreign investments “because they know for sure that investors won’t come to such a frightening place,” he said. The government has introduced corporate residence visas for foreign entrepreneurs who have invested more than US$50 million in the Maldives. The new corporate resident Maldives scheme “aims to provide foreign investors in the Maldives with privileged and fast-track services,” according to the economic development ministry. “My government will accord hospitality to all foreign investors who come here. We will accord safety and satisfaction to all of the foreign investors who are here. We would like foreign investors to feel like friends among friends, Maldivians among Maldivians,” said president Abdulla Yameen at a ceremony last night. The government is seeking “to attract net worth high value investments” to the Maldives, he added. The corporate resident visa holders will belong to “a privileged, elitist club,” Yameen said. Card holders will have permanent residency and will not have to wait in queues at immigration. President Yameen handed out entitlement certificates under the scheme to the Bahrain Telecommunications Company (Batelco), Housing Development Finance Corporation, Seaplane Holdings, Mauritius Commercial Bank, and Hitachi. “This is the only way we believe third world countries, small countries like Maldives, can prosper and transform our economy,” Yameen said in his remarks in English. The opposition has previously criticised the lack of significant foreign investments despite assurances from the government following the passage of its flagship special economic zones legislation in August last year. The main opposition Maldivian Democratic Party recently alleged corruption in a deal with Dubai Ports World to develop a commercial port and free trade zone near Malé. The opposition also contends that the previous administration’s abrupt termination of a contract with Indian company GMR to develop the international airport has irreparably damaged investor confidence. The Indian infrastructure giant is seeking US$803 million as compensation. “We are looking at foreign investments as part and parcel of our economic development. We welcome foreign investments as partners in our developmental work,” he said. “There are no strings attached to foreign investments in the Maldives. Foreign investments can come in 100 percent foreign or it could be a collaborative effort with joint venture Maldivian partners,” he said. The government has invited foreign investors to consider “challenging and attractive investment opportunities” such as the iHavan transhipment port project. “Maldivian youth aspirations are tremendous. They are enormous. It is from housing to jobs and also to improving their wellbeing. The only way to do this is to attract our doors to all foreign investments who want to invest in major, major investments here,” he said. The US$300 or US$400 million bridge project is “enormous” for the Maldives with its per capita income of about US$7,000, Yameen said. “What it entails is not only growth, what it entails is assurance of jobs for Maldivian youth,” he said. Economic returns in the Maldives is “as good as any you can have,” he said, noting that investments in tourism can be recovered in four or five years. The Maldives is also “a low tax country” with a comparatively low business profit tax, he said. “This is a safe place for investments, this is safer than the safest place elsewhere on the earth,” Yameen said. The government will charge a US$25,000 application fee from potential investors in its flagship Special Economic Zones. Accepted applicants are also required to pay a US $1 million guarantee to a bank account of the board’s choice within 15 days of receiving the initial permit, under the new SEZ investment board regulations. The regulations, published on April 2, set out the terms for a programme that the government hopes will bring in $100m by August. It has so far signed one memorandum of understanding for an SEZ. The regulations give the President the authority to appoint the board’s chair, vice-chair and to dismiss board members at any time. They also give the board the power to freeze potential investors’ local assets if the permit is terminated and the investor has any outstanding debt. The board will have the discretion to cancel all visas to migrant workers if a permit is terminated. Speaking to Minivan News, Economic Council co-Chair and Tourism Minister Ahmed Adeeb said the government is “looking for serious investors”, pointing out that the minimum investment for a SEZ stands at US$ 150 million. Adeeb said the application fee was set after consulting with investors, and that processing these proposals is hard work. President Abdulla Yameen has previously declared that the SEZ act would become “a landmark law” that would strengthen the country’s foreign investment regime. The only SEZ activity since the act was ratified by President Yameen in August 2014 has been a memorandum of understanding for a Dubai Ports World free trade port. Adeeb said, however, that there is a lot of support for the SEZs, pointing out that Indian investors have shown interest in building a gold refinery after Maldives granted duty free status to gold. The government estimates that it will be able to acquire over US $100 million in acquisition fees from the SEZs by August 2015. The US$100 million figure has been included as one of three revenue-raising measures in the 2015 annual state budget, alongside increasing import duties and taxes. “I think we will meet budget targets. Some investors are prepared to pay a US $100 million acquisition fee on a single project,” said the tourism minister. The first SEZ project is likely to be the Dubai Ports World free trade port in Thilafushi in Male’ atoll, followed by the mega I-haven port project in the north, Adeeb added. The government signed an MoU with the Dubai company on the port on March 19, while it is still seeking investors for the I-haven project on the northernmost Ihavandhihpolhu (Haa Alif) atoll. During parliamentary proceedings, the opposition Maldivian Democratic Party (MDP) submitted more than 300 amendments to the SEZ bill. The MDP claimed that the law would pave the way for money laundering and other criminal enterprises, while authorizing the president to “openly sell off the country” without parliamentary oversight. The government, however, maintained that SEZs with relaxed regulations and tax concessions were necessary to attract foreign investors. Indeed, during the Progressive Party of Maldives’ ‘Successful 365 Days’ event in Malé last week, fisheries minister Dr Mohamed Shainee noted that the secret of the economic policy’s successes was President Yameen’s intellect and background in economics. Yameen had vowed to eliminate the persisting fiscal deficit, achieve a surplus in his third year in office, and double per capita income by the end of his five-year term. At the launching ceremony of the PPM’s manifesto, Yameen pledged to save MVR4 billion (US$259 million) from the state budget, claiming the 2013 budget had included up to MVR2 billion (US$129 million) in unnecessary expenditure. Despite these pledges, however, the incoming administration in December 2013 submitted a record MVR17.5 billion (US$ 1.1 billion) state budget for 2014 for parliamentary approval, including MVR1.1 billion (US$71 million) more in recurrent expenditure. Moreover, proposed streamlining amendments to the Decentralisation Act were not submitted ahead of the second local council elections held on January 18. After pledging to slash wages of political appointees by 30-50 percent, President Yameen instead imposed a pay cut of 12.5 percent for state ministers and deputy ministers in December, as well as taking only half of his own MVR100,000 (US$6500) salary. The Yameen administration currently has five ministerial rank appointees – including two ministers at the President’s Office – 36 state minister rank appointees, and 72 deputy minister rank appointees. Last week, former PPM MP Ahmed Shareef Adam became the 10th deputy minister at the education ministry. While the government fulfilled a pledge to raise the monthly allowance for the elderly to MVR5,000 – reliant on a MVR1 billion investment scheme outside the budget – Finance Minister Abdulla Jihad admitted in August that the government had been forced to rely on the state budget for the handouts. The government also planned to fulfil a pledge to provide MVR10,000 (US$650) a month for fishermen “regardless of catch” during lean months through a similar insurance scheme with a monthly premium of MVR500. However, only one fishing vessel has reportedly registered in the scheme so far. Meanwhile, in contrast to the intransigence faced by former President Dr Mohamed Waheed in obtaining parliamentary approval for his policies, the new administration was able to vote through numerous revenue raising measures in the outgoing 16th People’s Majlis. The measures included raising the airport service charge from departing foreign passengers to US$25, hiking import duties, reintroducing the tourism bed tax until the end of November, raising the Tourism Goods and Services Tax (T-GST) to 12 percent, and introducing GST for telecommunications services from May 1. Subsequently, the parliamentary elections in March saw the PPM and coalition partner the Maldives Development Alliance secure a comfortable majority in the 17th People’s Majlis. In the aftermath of the polls, four independent MPs, three opposition MDP MPs, and three Jumhooree Party MPs signed for the PPM, sealing a 43-seat simple majority for the ruling party. The parliamentary majority subsequently allowed the government to fast-track its flagship special economic zone (SEZ) legislation – the cornerstone of President Yameen’s economic policy – in the face of vehement protests from opposition MPs. The MDP contended that that the law would pave the way for money laundering and other criminal enterprises, undermine local councils, and authorise the president to “openly sell off the country” without parliamentary oversight. Former President Mohamed Nasheed dubbed the legislation the ‘Artur Brothers bill’, referring to an infamous pair of Armenians linked with money laundering and drug trafficking who made headlines last year after they were photographed with cabinet ministers. President Yameen declared in April that the SEZ bill would become “a landmark law” that would strengthen the country’s foreign investment regime. The mega projects include iHavan or ‘Ihavandhippolhu Integrated Development Project,’ – which envisions a transhipment port to capitalise on trade and commercial opportunities in the South Indian Ocean – a ‘youth city’ in Hulhumalé, the expansion of the Ibrahim Nasir International Airport (INIA), relocation and expansion of the central port to Thilafushi, and exploration for oil and gas. Meanwhile, following the historic visit of Chinese President Xi Jinping in September, China announced it would “favorably consider” financing the iconic Malé-Hulhulé bridge should it prove feasible. President Yameen recently announced that further land reclamation the second phase of the Hulhumalé development project would begin before the end of November. During last week’s anniversary celebrations, Dr Shainee noted that 19 foreign investors have registered in the country, with a commitment of investing over US$600 million, although no further details were revealed. While the government appears to be counting on large investments from China – with President Yameen recently slamming “western colonialists” – the fate of foreign investments made during former President Mohamed Nasheed’s tenure is likely to make potential investors wary. While the Tatva waste management deal terminated was in September, the GulhiFalhu Global Green City project was recently stalled. More worringly, a Singapore arbitration tribunal in June found the government of Maldives and state-owned Maldives Airports Company Pvt Ltd (MACL) “jointly and severally liable in damages”to GMR for the termination of a “valid and binding” concession agreement. The Indian infrastructure giant is currently claiming US$803 million in damages for the abrupt and wrongful termination of the airport development contract. 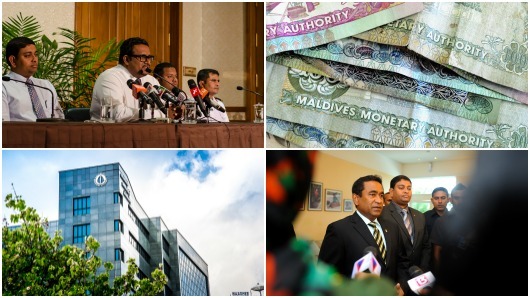 Analysis: President Yameen’s first year – Towards good governance? 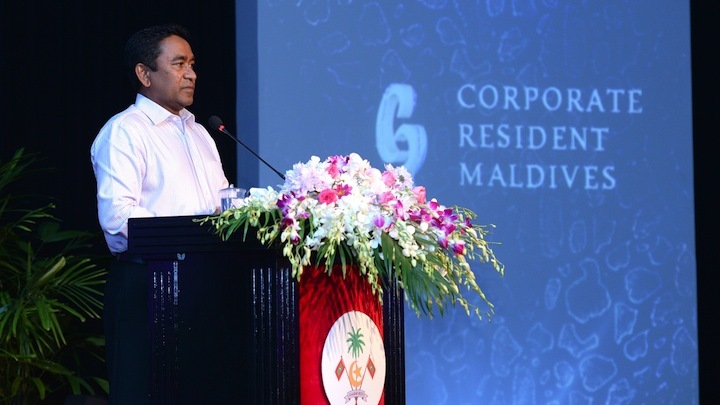 President Abdulla Yameen has warned foreign companies of the importance of political risk assessment before investing in countries such as the Maldives. “At a time when you had a very heightened political environment in Maldives, at a time when the parliament was polarised, it was a pity that political risk assessment was not undertaken by GMR,” said the president. Yameen’s comments came during the scholarship awards ceremony of Trans Maldivian Airways’ (TMA) youth pilot training programme – a company he cited as an example of successful foreign investment after its takeover by the Blackstone Group last year. GMR’s landmark airport development deal – signed during the prematurely ended term of President Mohamed Nasheed – was itself abruptly ended by the succeeding administration in December 2012. The concession agreement to develop Ibrahim Nasir International Airport was signed in June 2010, the same month in which Nasheed’s entire cabinet resigned in protest against what it considered to be the obstructionist policies of then-opposition parties. Legal action initiated by the deal’s opponents eventually invalidated the deal’s funding arrangements, leading the government of Dr Mohamed Waheed to justify the annulment using the legal principle of ‘frustration’ – in which unforeseen events render contractual obligations impossible. In June this year, a Singapore court of arbitration ruled the deal had been “valid and binding”, finding the Government of Maldives liable for damages still to be determined by the court. The Maldivian Democratic Party had subsequently called for the reinstatement of the GMR deal, threatening to dissolve any future deals to redevelop the country’s major international airport. During yesterday’s ceremony, President Yameen continued to appeal to foreign investors, expressing the country’s desire to diversify from the dominant tourism industry. “We are not just about the sun, the sand, the sea – Maldives is more subtle. That is the message we are trying to give to the world now,” he told those in attendance at Traders Hotel. The government’s drive for new investment has focused upon five ‘mega-projects’ as well as an improved climate for new investors, facilitated by controversial plans to establish special economic zones via legislation recently introduced to the People’s Majlis. Tracing the journey of foreign investment in the Maldives alongside his own public career, Yameen noted that foreign investments were seen as “punitive” in the mid 1980s, with local laws designed to prevent them. Yameen – who spent two decades with the Ministry of Trade and Industries – went on to describe frequently “lonely” and “solitary” overseas discussions on potential investment in the Maldives. Indeed, the president described the difficulty he had in persuading Blackstone’s risk management personnel to invest in the country. The deal saw the US private equity firm gain a monopoly in the vital seaplane sector as rival firm Maldivian Air Taxi was bought simultaneously. Congratulating those awarded the TMA training scholarships yesterday, Yameen pointed to the country’s “motivated”, “highly intelligent” and “easily trainable” youth as a key resource, urging the seaplane operator to increase the number of Maldivian staff members. He also expressed his gratitude to the company for providing assistance in his “endeavour which is to bring prosperity throught the avenue of finding ways for the youth”. The government recently revealed that a number of companies had expressed interest in the government’s Hulhumalé youth city project – which will reportedly include youth-specific housing, international class sports facilities, a theme park, and a yacht marina, catering to a population of 50,000. The Ministry of Economic Development will be presenting five investment opportunities planned for the country’s development at the Maldives Investment Forum in Singapore this month. The forum will aim to increase the interest of Asian-region investors, and will be the first forum of such a scale to be hosted by the Maldives in another country. President Abdulla Yameen will also be attending the forum, which is scheduled for April 25 at the Marina Bay Sands hotel in Singapore. “It is a showcasing of the largest infrastructure projects, for company registration, to the international investment community. The keynote will be by the president and we are working on the details for the showcase,” said Permanent Secretary for the Ministry of Economic Development Yusuf Riza. Although Riza said the details of the projects were yet to be announced, local media outlet Haveeru has reported details of the developments to be presented to potential investors. These are reported to be: the development of Ihavandhippolhu as an economic zone, a project to develop ‘I-Heaven’ and Ibrahim Nasir International Airport (INIA), the second phase of Hulhumalé’s development, a project to develop the current commercial harbour at Thilafushi, and a scheme to extract fuel and gas from the Maldivian region. In my previous article in this column, I raised eight pertinent questions about the Waheed Government’s plan to sell 40 percent shares in MACL to Maldivian companies and individuals. Does the proposed sale maintain economic sovereignty or undermines it? Is the sale of MACL shares really an economic necessity in the current context? What is the reason why the sale has to be conducted within a span of 7 days? Why is there an absolute silence on the valuation of MACL shares? Does Waheed have any moral or constitutional authority to make this decision? Why is there absolute secrecy on issues such as the process to be followed for the sale? Is the timing of this transaction appropriate or is it designed to suit vested interests? Are we seeing a repeat of a series of shady transactions in the aviation space like Mamigili Airport lease extension and sale of Gan Airport to the Champa Group? My conclusion based on a detailed review of each of these questions was that this proposed sale of MACL shares has all the elements of a big scam and that the Waheed government is going ahead with it brazenly. Since then, the Privatisation Board has come out with a strongly-worded statement that the only prerogative to manage the privatisation process for government owned companies lies with itself. Strangely, the board hasn’t even been contacted as yet for anything related to the proposed sale of MACL shares. Vice Chairperson of the Privatisation Board Mohamed Yasir quoted specific sections of the law that gives power to the privatisation board to decide on which companies to privatise, what should be the fair process, what should be the fair valuation as well as the process of establishing the same through an independent expert. The above statements highlight the audacity of the attempt being made by Waheed government at this mega-loot. I have raised the question of Waheed’s moral and constitutional authority earlier. It now seems that that Waheed Government hasn’t even been acting within its legal authority on this issue. As per the process laid out in law, such privatisation of a government asset should be managed by the Privatization Board after getting Majlis approval for the same. I understand, based on discussions with people who are in the know of things that Waheed has set up a Special Committee headed by Azima Shakoor to manage the process for sale of MACL shares. In essence, rather than having the Privatisation Board and the Majlis take decisions and manage the process, it is the Special Committee headed by Azima Shakoor, Economic Committee of the cabinet and the MACL Board which have been asked to take decisions and manage the process. This is a constitutional transgression by an outgoing government, which certainly needs to be stopped in the tracks. As a matter of fact, the ‘decision’ by Economic Committee of the cabinet is illegal to start with, since it is not authorised by law to make that decision and at best, they could have put forward a proposal to the board highlighting all the economic arguments and analysis in support of the proposal. What is also most interesting to note here is the fact that an economic decision by the cabinet is not implemented by the Finance Minister but by the Attorney General, who is supposed to be the legal advisor to the government. So much so that the government’s Finance Minister doesn’t even have the authorisation to answer any questions related to this issue and he has been diverting all questions towards Azima Shakoor. It is not the Attorney General’s mandate to head committees which implement a major economic policy decision of the government. That the Attorney General is heading the committee also says a lot about what is going on – it clearly indicates that Waheed government’s focus is on ensuring that they get away with this sale without any legal hurdles rather than ensuring that government gets the right economic value for its asset. It is difficult to understand the rush for selling MACL shares by a government that will have no constitutional validity three weeks from now. This level of urgency in selling off government assets may have been called for had we been in very severe economic trouble with an imminent risk of sovereign default or any other comparably dire situation. Fortunately for the Maldives, such a desperate situation hasn’t arisen as yet and this level of urgency behind the rushed sale process is certainly suspicious and needs to be investigated deeply. Moreover, divesting a state asset is a significant economic policy decision. In most democratic countries across the world, and our democracy is modeled on principles from such stable democracies, there is a code of conduct put in place in light of a pending election. For example, as soon as the elections are announced in India, which is typically 6-8 weeks before the election date, a code of conduct comes in place which prohibits the government from making any new decisions or even undertaking activities such as laying foundation stones for projects! For these 6-8 weeks, the government in power is barred from making any new decisions and only has to focus on implementing the already ongoing initiatives. However, we have a case here where an out-going President is making and implementing a major economic policy decision one week before Presidential elections and only three weeks before he is certain to remit office. As an unelected President, Waheed has made a number of significant economic decisions about our national assets in the last 1.5 years and has got them wrong, which will have a significant bearing on the country in the times to come. He allowed the sale of two seaplane operators to a single monopoly player but never cared to assess the implications of letting a critical part of Maldives’ tourism value chain be totally controlled by a single entity with now unchallenged power over the entire tourism sector. Much of the tourism industry has already highlighted how the sale of sea plane operations to a single monopoly player is posing an increasing threat to the viability of many resorts. He also unilaterally cancelled the GMR concession agreement without caring to understand the potential future costs of the decision on future generations and the available trade-offs. Early indications are that the GMR arbitration is not going too well for Waheed government and we may potentially be looking at a huge claim from GMR by next year, which will ultimately have to be paid for by taxpayers like you and me. He may no longer be the President in three weeks but he is doing all he can to make one final and the most outrageous raid on the Maldives exchequer to satisfy his and his cronies’ insatiable thirst for our national resources. All the early warning signals are there and enough alarms have been raised well in time for all the relevant independent institutions such as ACC, Privatisation Board and the Judiciary to take note of this mega-scam-in-the-making. It will be a significant failure of Maldivian institutions and even the Maldivian people if an unelected head of government is allowed to get away with this significant a loot, bypassing all the regulations and laws laid out in our constitution. The Maldives National Chamber of Commerce and Industry (MNCCI) has warned that the “deteriorated” and “outdated” amenities used to support the Maldives’ lucrative resort industry will negatively impact growth across the tourism sector, if left unaddressed. MNCCI Vice President Ismail Asif told Minivan News that despite the “seven star” reputation of the country’s exclusive island resorts, the group was receiving growing complaints that the service, amenities and treatment afforded to guests by the country’s public and private sector threatened to significantly damage the destination’s reputation. The comments were raised after several multinational hospitality groups alleged earlier this month that the sale of the Maldives’ two main seaplane operators to US-based private equity fund Blackstone in February was having a “significant” negative impact on the wider tourism industry as a result of the monopoly created. MNCCI Vice President Asif told Minivan News that the chamber had not received any “particular concerns” related to the Blackstone deal, but had instead noted growing criticisms of standards of service from state and private institutions vital to the country’s resort industry. “We have had e-mails from foreign investors and business people about the general service and standards at the country’s airport as well as the quality of transportation [available to tourists],” he said. “We are not able to distinguish [whether the complaints] are about seaplanes or speedboats. Asif also identified the current condition of Ibarahim Nasir International Airport (INIA), a general lack of amenities, and the attitude of customs and immigration officials towards foreigners visiting the country as major concerns needing to be addressed by the wider industry. Late last year, the present government controversially scrapped a US$511 million contract signed under the previous administration with India-based infrastructure group GMR to develop and manage an entirely new airport terminal. The state is subsequently facing a US$1.4 billion compensation claim from GMR for its decision to terminate the contract over allegations of corruption, claims ultimately rejected by the country’s Anti-Corruption Commission (ACC). The MNCCI has nonetheless maintained that the government’s decision to abruptly terminate the GMR contract did not hurt foreign investor confidence, with Asif claiming that the existing airport structure could be modified to improve service standards. With the eviction of GMR construction of the new terminal is stalled at 25 percent complete, according to the government’s own engineering assessment. Criticisms had also been raised over the conduct of customs officials and regulations banning tourists from bringing alcohol into the country to consume on the country’s resorts, according to the MNCCI. Asif claimed there was minimal information provided to visitors about restrictions on alcohol and pork products outside of resorts. “It’s not like tourists will bring large amounts of liquor with them. Often the value of the goods they are holding is high, but a customs person will have no idea of the goods or the culture. Their response is ‘liquor is prohibited here’,” he claimed, accusing police and other state authorities of favouring restrictive laws on tourists to reduce their own levels of responsibility. Asif argued that all national bodies needed to take greater responsibility to ensure treatment of tourists matched the services being provided by the resort industry. The MNCCI has also stressed the need for political stability, the lack of which he had alleged has had a considerable impact on investor confidence and business development since the controversial transfer of power on February 7, 2012. With a run-off vote scheduled for September 28 expected to decide whether former President Mohamed Nasheed or MP Abdulla Yameen will take office over the next five years, Asif said it was important to have an elected and head of state – no matter the candidate. He argued that a Commonwealth-backed Commission of National Inquiry (CoNI) last year dismissed Nasheed’s allegations that he was removed from office in a “coup d’etat” had led to an increase of larger-scale investment – particularly with resorts. However, with a number of properties remaining under construction, stability within the country’s domestic politics and court system was a huge problem needing to be addressed, he said. Tourism Minister Ahmed Adheeb was not responding to calls at time of press in response to the MNCCI’s concerns. Meanwhile, the government earlier this month said it hoped to secure longer-term financing to plug a shortfall in annual revenue that has seen the number of 28-day Treasury Bills (T-bills) sold by the state almost double in July 2013, compared to the same period last year. Finance Minister Abdulla Jihad told Minivan News at the time that the state’s increased reliance on short-term T-bills between July 2012 and July 2013 reflected the current difficulties faced by the government in trying to raise budgeted revenue during the period. “Both the hopefuls in the Presidential race in Maldives said that they would welcome and encourage foreign direct investment, but differed on the issue of the ousted Male airport operator GMR,” writes R. K. Radhakrishnan for the Hindu newspaper. “Former President Mohamed Nasheed and former President Maumoon Gayoom’s half-brother, Yaameen Abdulla, are pitted against each other in a second round run-off, scheduled for September 28. The first round, held on September 7, did not throw up a clear winner. To win, a candidate has to garner over 50 per cent of the votes. The Nasheed Government had earlier granted the contract to GMR–MAHB (Malaysia Airports Holdings Berhad) to operate the airport. After he resigned under controversial circumstances on February 7, 2012, the next government, headed by Mohamed Waheed, terminated the contract, claiming it was invalid from the beginning. GMR had slapped a $1.4-billion compensation claim against the Maldives Government in an arbitration that is now underway in Singapore. Yaameen said that the contract was not done properly. ‘Foreign investment and GMR are two different issues. We welcome foreign investment. In the case of GMR, the law was not followed,’ he said, when asked about FDI in general and GMR in particular. President Mohamed Waheed’s secretary Masood Imad too was of the view that the airport issue should be treated as closed. ‘GMR can come into Maldives with some other project. The Male’ airport is too much an emotional issue,’ he said.